A couple surprises friends and family in this sweet video where a gender reveal party turns into a baby reveal party. Watch for the amazing reaction from the crowd. Could this be the best kept secret ever? When a California couple held a gender reveal party, they told guests to guess two genders, for twins. But it turns out gender wasn't the only surprise that day. 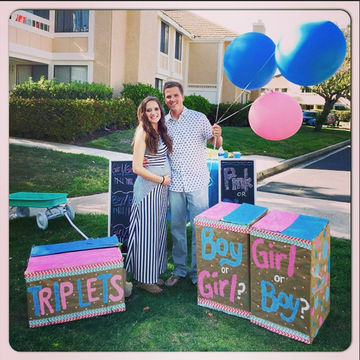 The event in the adorable video below starts out as a pretty traditional gender reveal party: Desiree and Ryan Fortin of San Diego asked family and friends to guess boy/girl combinations, which they tallied on a chalk board. For the big reveal, the couple, who had struggled with infertility, brought out two sealed cardboard boxes containing colored balloons pertaining to the gender of their twins. The balloons in both boxes were blue, for boys. "Well, that is awesome. I'm excited about two boys," said dad-to-be Ryan. But he had one more surprise up his sleeve: "What if I told you that you were all wrong? We're actually having triplets!" A third box is wheeled out from behind a bush, amid cheers and gasps from from crowd. It's opened and out pops pink balloons—the third baby will be a girl! Desiree shared her and Ryan's struggle to become pregnant on her blog, Our Journey to Parenthood. After two unsuccessful attempts at intrauterine insemination (IUI), the couple became pregnant with the triplets by in vitro fertilization (IVF). "The journey we have been given on our road to parenthood is nothing what I thought it would be," Desiree wrote in a blog post. "There have been LOTS of tears, heart-wrenching moments, physical pain, grief, jealousy, and a complete feeling of emptiness. However, despite how trying our journey has been, it has been the most hopeful, rewarding, joyful experience I have ever shared in. I wouldn't trade our story for anyone's." The Fortins' happy ending certainly gives hope and reassurance to hopeful moms-to-be everywhere. Watch but be warned: You might just tear up a little. Plus, there's something about Phillip Phillips's "Home" as a soundtrack that would make even a video of a blank wall sniffle-inducing.